Patent pending design of the Brush Medic Pro UV Sterilizes and safely dries makeup brushes in minutes using a dehumidifying chamber without heat blown that could damage bristles or glue (up to 10x quicker than conventional air drying). Germicidal Deep UV-C Sterilizing Technology kills most viruses, germs, microorganisms and bacteria to 99.9% effectively free in 10 minutes. The Pro model has a 2nd upper UV Sterilizing lamp and tray to sterilize makeup and small palettes. Perfect for the professional or everyday woman for less breakouts and worries of skin health, all while extending the life of your expensive brushes. The Brush Medic Pro is a must to add to the professional makeup artist's tools to assure clients that health and safety is their priority, not to mention speeding up valuable time and eliminating need to carry so many extra clean brushes. Compact size is great for home, travel or business. The Brush Medic Mini UV Sterilizes and safely dries makeup brushes up to 3x quicker than conventional air drying. Germicidal Deep UV-C Sterilizing LED Technology kills most viruses, germs, microorganisms and bacteria to 99.9% effectively free in less than 10 minutes. Great for personal and travel use, only 3" wide. Suspends brushes to eliminate damage from water seepage. When your clients health and safety is your company's top priority!! 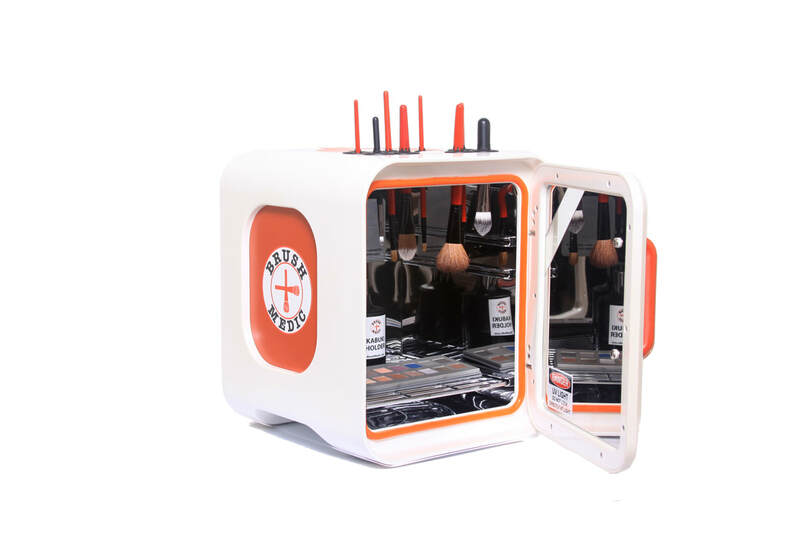 The multi-use patent pending design of the Brush Medic Salon, UV Sterilizes salon tools and safely dries makeup brushes up to 10 times quicker than conventional air drying using an dehumidifying system. Germicidal Deep UV-C Sterilizing Technology kills most viruses, germs, microorganisms and bacteria to 99.9% effectively free in 10 minutes from makeup brushes, makeup, hair brushes, nail equipment and other salon tools. The Salon model is designed for commercial use to assure customers that their health and safety is the utmost priority of the company all while speeding up valuable time and eliminating excessive amount of brushes needed.